A video journalist covers a news event. 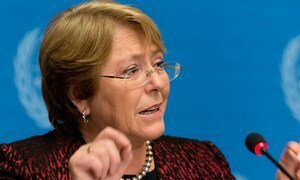 Michelle Bachelet, the UN High Commissioner for Human Rights, whose Office (OHCHR) issued the report Tuesday, underscored that the findings show the severity of dangers independent journalists face in Myanmar. According to the report, The Invisible Boundary: Criminal prosecutions of journalism in Myanmar, laws relating to telecommunications, official secrets, unlawful associations, electronic transactions and even obscure laws relating to imports and aircraft, have been used to try and prosecute journalists in recent years. In one case, three journalists were arrested in June 2017 for covering an event to mark the International Day Against Drug Abuse and Illicit Trafficking in an area under the control of an armed group in northern Shan state. They were charged under the Unlawful Associations Act. The case was dropped, but not before they had spent 67 days in detention. In another case, two Christian Baptists from Kachin state, were arrested in December 2016 under the same law, for assisting journalists who had travelled to northern Shan state to report on the conflict there. They were held incommunicado for several weeks and eventually received prison sentences of two years and three months having also been charged under an Import-Export statute, relating to their alleged use of unlicensed motorbikes, the report states. Other cases involved the invocation of the same Law against journalists for using a drone to film the national parliament building and a Telecommunications statute was used to target a journalist for posts on the social media site, Facebook. In conclusion, the report also sets out a series of recommendations, including a review of all legal provisions impacting the right to freedom of expression with a view to repealing or amending those that do not comply with international human rights law. It also calls for the immediate and unconditional release of the two Reuters journalists, Kyaw Soe Oo (also known as Moe Aung) and Thet Oo Maung (also known as Wa Lone), as well as all other journalists currently in detention for the “legitimate and peaceful exercise of their right to freedom of expression”. The two Reuters journalists were sentenced to seven years’ imprisonment under the Official Secrets Act in connection with their coverage of a massacre, by the military, of men from the minority Muslim Rohingya community in the Inn Dinn village, Rakhine state.